We don’t need special websites for people with special requirements. Have you ever forgotten to buy new batteries for your mouse? We are designing the web for our future selves. Don’t use Flash. It isn’t working on most mobiles. It isn’t „working“ on most PCs either. It can be made accessible on Windows and IE only. POSH5 Use the best HTML5 Element available for the task at hand. HTML5 Includes many accessibility features (although others claim otherwise). It is not the spec to look to when searching for web accessibility techniques. WCAG2 Is the spec for accessible web content. Provides an exhaustive list of techniques to make web content accessible. 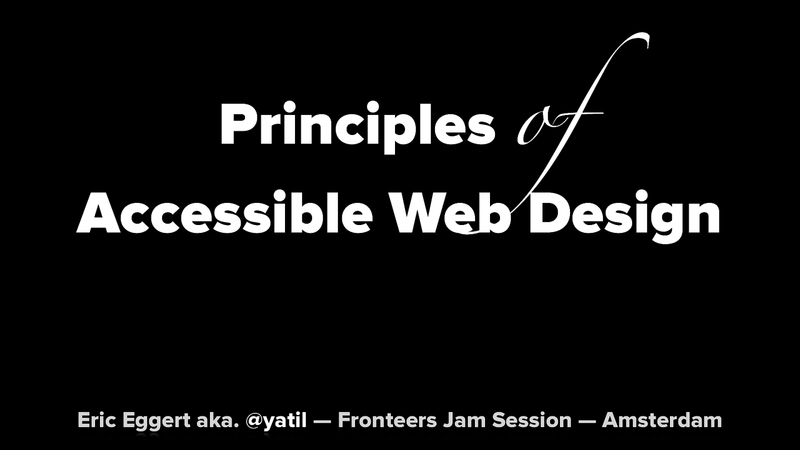 View Principles of Accessible Web Design.